Amaco Opalescent Glazes Low Fire Glazes Cone 05. Most of the AMACO® Opalescent Glazes have a high gloss with an iridescence similar to mother-of-pearl. Best results are achieved with three or four applications of glaze. On textured ware, these iridescent glazes flow thin on relief and thick in incised areas, giving an added dimension on the surface. 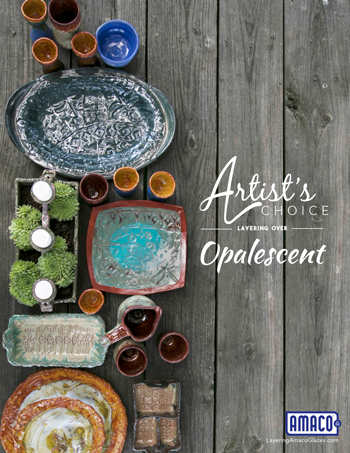 AMACO® Opalescent Glazes can be used very effectively in Raku firing. We suggest controlled experimentation with Opalescent glazes (for example O-42, O-23 at Cone 5 (2205°F, 1207°C). When fired at this temperature on the inside of a stoneware bowl, the glaze flows to produce a variegated bottom and thins at the rim to expose more of the clay body. AMACO® Opalescent Glazes are supplied in liquid, ready-to-use form in pint jars. They are applied on a mature Cone 04 (1971°F, 1077°C) bisque by brushing, dipping or pouring. On red bisque, these glazes should be applied rather heavily, and a slow rather than fast firing is best. Firing range is from Cone 05 (1911°F, 1044°C;) to Cone 03 (2019°F, 1104°C). The recommended firing temperature for these iridescent glazes is Cone 05 (1911°F, 1044°C). Try layering these with classroom safe Artist Choice Series glazes for incredible effects !